Cal Newport is a Computer Science Professor at Georgetown University, and the author of multiple books including So Good They Can’t Ignore You and Deep Work: Rules for Focused Success in a Distracted World. 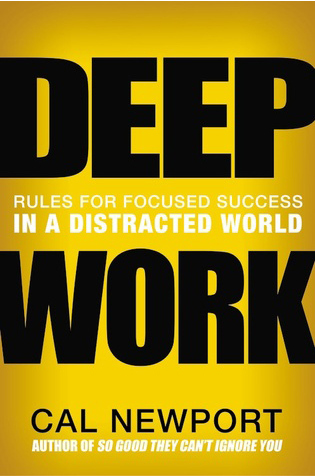 In Deep Work Newport argues that we as people are in a constant tug of war between shallow and deep work; and in our current society, shallow work is winning. Deep Work: Professional activities performed in a state of distraction-free concentration that push your cognitive capabilities to their limit. These efforts create new value, improve your skill, and are hard to replicate (2). Shallow Work: Non-cognitively demanding, logistical style tasks, often performed while distracted. These efforts tend not to create much new value in the world and are easy to replicate (6). Per Newport’s definitions, Deep Work is more dependent on a state of mind than the content of the work. He offers a number of strategies and suggestions for how to carve out time in your day to allow for this state of mind. Many of the people cited as examples of deep workers are well-established writers or artists who have the ability to cut themselves off from the world. However, many professionals don’t have that luxury. The focus of Thrivner’s discussion surrounded how to apply these principals in everyday life for everyday people. These ideas are also at the forefront as we develop software, including Arena, Momentum, and Chart. How long would it take (in months) to train a smart, recent college graduate with no specialized training in my field to complete this task (229)? This question forces you to think carefully about the amount of time and effort a task or project might take. The idea behind this question is a key part of Arena in that each project is sized to reflect the overall effort and impact. Customers tell us that this visualization is a game-changer. No longer do they work in endless lists where everything looks the same because they can clearly differentiate between the small, simple projects and the more impactful, audacious ones. Newport implores his readers to “treat shallow work with suspicion because its damage is often vastly underestimated and its importance vastly overestimated (221).” Into every schedule some administrivia must fall but carving out time for deep work is typically the path to learning new things, advancement, promotion, new products, and more. In Arena, deep work can be identified as high effort and high impact (e.g., very big bubbles!) and prioritized using the Must, Should, Could designations. One surprising suggestion from Deep Work is to plan out every minute of your day. Newport talks about how many people’s initial reaction to this idea is that it’s very robotic and will severely limit creativity or inspiration. He argues that there is often too much emphasis on inspiration and that the deep work that comes after inspiration is more important for adding value. He also clarifies that the goal isn’t to conform to a rigid schedule or to fill your entire day with deep work; it is also important to add in planned fun activities and breaks. By actively planning out the entire day and giving every minute of your day a job, you allow yourself to commit to the work more fully while limiting distractions. 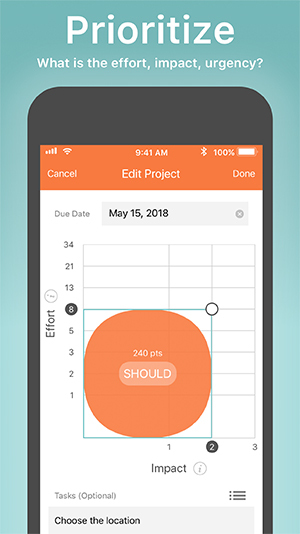 With the calendar view, Arena users can clearly see calendar commitments (e.g., school drop-offs, staff meetings, business lunches) and plan when each of their projects will be completed that day. There’s no more wondering what to do when because the day is planned. This provides tremendous peace of mind. If the plan goes awry, it’s easy to adjust with a couple of taps. Mentally, that feels so much better. The human brain isn’t great at storing and managing meetings and to do’s, which causes so much stress. By offloading projects and tasks into Arena, planning each day, and then working the plan, users report ease, productivity, and, yes, deep work. Newport talks about two types of measures – lag measures and lead measures – which is an idea co-opted from The 4 Disciplines of Execution. He discusses how lag measures describe the ultimate goal and often come too late to change behavior, whereas lead measures “measure the new behaviors that will drive success on the lag measures.” For his career, a good lag measure is the number of papers he publishes in a year, and a good lead measure is “time spent in a state of deep work dedicated toward your wildly important goal (publishing papers).” The idea of being able to track progress in the form of a lead measure is inherent in Arena. Many users use the points to understand what’s typical for them (e.g., their usual velocity). In a future version of the software, there may be encouragement to press for more in a given day or a warning that too much has been planned. For now, users report satisfaction looking back at their green bars and seeing their accomplishments stack up over time. Newport, Cal. Deep Work: Rules for Focused Success in a Distracted World. Grand Central Publishing, 2016.